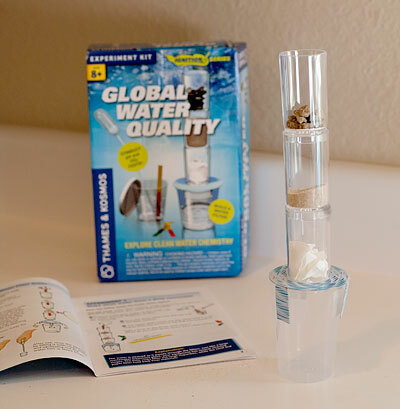 A few months ago I received a Global Water Quality chemistry kit from Thames and Kosmos to review for the The Old Schoolhouse® Magazine. You can find my full review on their site. As a mom of four girls, keeping STEM subjects engaging for my daughters is one of my top priorities. One of the ways I try to achieve this goal is by integrating hands-on science into our homeschool day as often as possible. 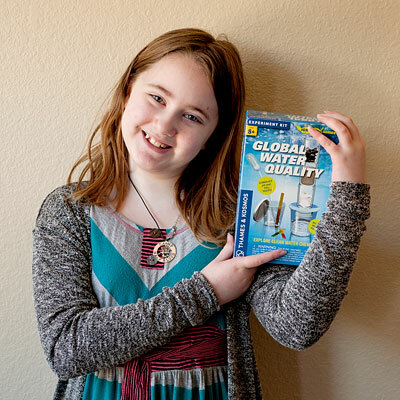 My nine year old has always loved chemistry, so she was excited to try the Global Water Quality chemistry kit from Thames and Kosmos. The eight experiments it walks you through are all fairly simple. First you get to make a basic water filtration tower to see that you can get muddy water to look clean fairly easily. However, in the very next experiment you attempt to filter watercolor paint or ink to see that your simple filter is not actually providing clean water. Experiment three is simply dissolving salt in a little water and then waiting a few days (or in our case, over a week) for the water to evaporate and leave behind the salt. The next experiment is of a similar vein and lets you eventually taste water that has evaporated from salt water and then condensed and collected in another container. Experiment five is pretty fun because you get to watch cress grow from seeds in three separate containers and then test the effects of salt, vinegar and not being watered on the plants. The sixth experiment is the one we weren’t able to do because we don’t own a kitchen scale, but if you have one you get to cut some fruits and vegetables and weigh them and then monitor their weight over the course of a few days to see that as the water inside the plants evaporates they become lighter. For the next experiment you get to measure the pH value of a variety of liquids. The final experiment involves collecting carbon dioxide from mixing baking soda and vinegar in a plastic bottle and then forcing the carbon dioxide into water in another plastic bottle to see what happens. I actually don’t really ever buy bottles of water or soda or anything so we weren’t able to do this experiment either. Some of the experiments include ideas for ways to expand on the experiment. For example, after after you create your first water filter tower it offers ideas of other items to include in the tower such as paper and sawdust. Then, after discovering that the water filter tower doesn’t do anything about watercolor or ink, the manual encourages you to try making a filter that uses activated charcoal, though you would need to go out and purchase some yourself. After each experiment, the manual explains why you got the result that you did, and why it’s important when thinking about cleaning water, the necessity of access to clean water, or the problem of water pollution. This kit is recommended for ages eight and up, and for the most part my nine year old was able to conduct the experiments without any help. While it’s certainly easiest to just hand my daughter the kit and let her work independently, I think her experience may have been richer if I had held onto the manual myself and told her what to do, because the explanations spoil the surprise of actually getting to see what result you get from your experiment. While the placement of the explanations makes them very simple to find, I actually wish that they had all been at the end, or even in a separate booklet so we could have enjoyed a greater sense of discovery as opposed to setting up experiments while already knowing what was going to happen. My daughter says she loved this kit and just wished that there had been more experiments to do. I’m not sure that the number of experiments is actually a con, though, because I feel like a kit that leaves my daughter still wanting to explore the subject more is a good thing. I do wish that the kit had been a bit more specific in the instructions for some of the experiments, though. There were several that we had to attempt multiple times before we got them to work due to the vagueness of the instructions. For example, in the first experiment, building a water filter tower, the instructions tell you to mix water and a teaspoon of dirt to create some dirty water, but it doesn’t tell you how much water to use. On our first attempt, we literally waited an entire day after adding the dirty water without a single drop of it making it all the way through the tower. The experiment that included growing cress seeds also just said to sprinkle sand on top of the seeds but didn’t say how much, and then it instructed us to moisten well. Because my daughter ended up putting varying amounts of sand and water in each container, the cress actually only grew well in one of the three containers. On the one hand, it was a good lesson on needing to be precise with science experiments, but on the other hand, it would have been nice to have three sets of plants to test during the main portion of the experiment. 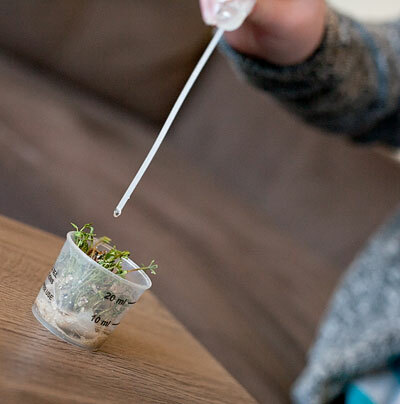 Also, even with the good lesson about being precise, if she had precisely added the exact amount of sand and water that resulted in the cress not growing well at all then we wouldn’t have had anything for the second part of the experiment. The experiment that was supposed to teach us about salt water evaporating and then condensing into fresh water, like rain that is created from seawater, completely failed on our first attempt. I ended up doing some research on my own before we attempted it again, but it still only barely worked. We really needed a hot, sunny day for the experiment, but it was the middle of winter and even here in Texas we didn’t have the optimal weather. Of the eight experiments, my daughter’s favorite was testing the pH level of various liquids. Half of the experiments in this kit require at least a few days of just waiting, but this one had immediate results. It also allowed my daughter to get as creative as she wanted in selecting liquids to test, which she really enjoyed. She had a great time discovering how acidic, neutral, or basic different beverages and cooking ingredients are. We didn’t get a chance to collect any rainwater or pond water or anything to test, but she ended up using all the strips we had. I’m sure she would enjoy getting more indicator strips in the future to keep testing stuff. All in all, this was a pretty good kit for $14.95. I appreciated the emphasis on the importance of clean water. I’ve been to a village in Zambia where children had to collect murky water from a shallow well, and I had the privilege of being present as a deep, sealed well our church had funded was drilled for the village. It was a moving experience and ever since I’ve talked to my kids a lot about how blessed we are to have clean water. Going through the experiments in the kit with my daughter provided a number of good conversation starters with her about why having clean water is so vital for everyone. The experiments we did may not have been very flashy or exciting, but the subject they were focused on is an important one.